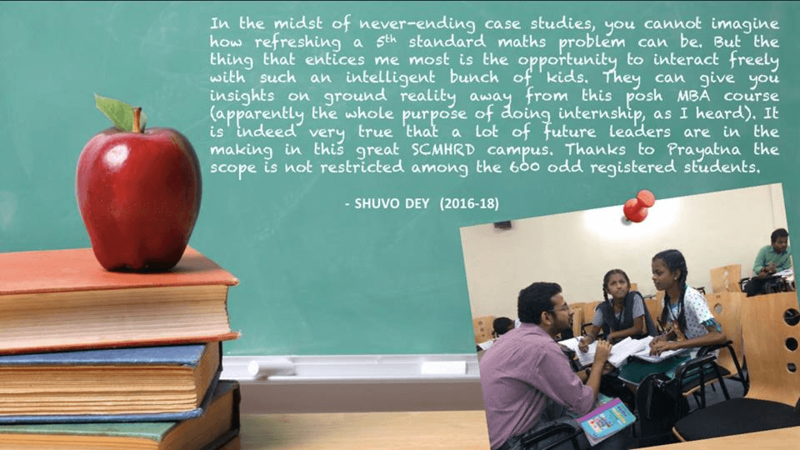 During your stay at the SIC campus, you must have seen young kids in the evening playing in the atrium, as some of your batch mates cajoled them to the classes and then the learning started for the day. Let us introduce you then, to Inspirit! INSPIRIT is a committee, run by the students of Symbiosis Centre for Management and Human Resource Development (SCMHRD), Pune, which focuses on quality education of children from poor sections of the society, giving them guidance and inculcating moral values with special attention towards developing their overall personality. 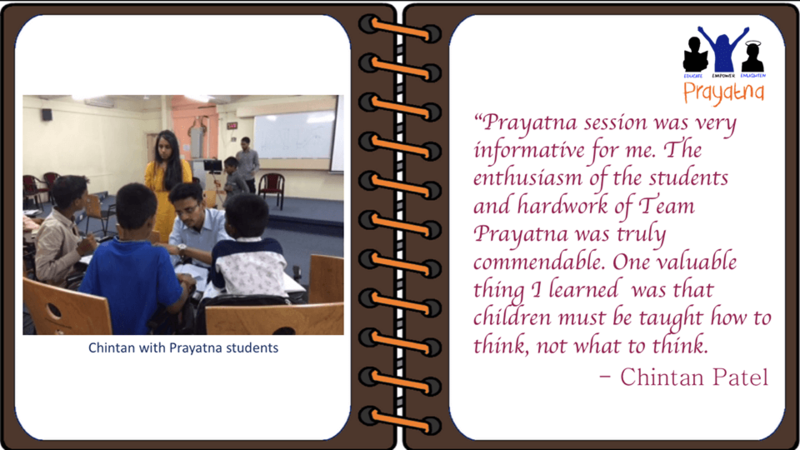 Founded in 2008 (as Prayatna), Inspirit has grown from a committee catering to the needs of 8 students to now catering to over 40 students, 6 days a week. We also work on creating awareness amongst parents with respect to Education and Hygiene and make them a responsible stakeholder in their child’s development. A future where the possibilities, opportunities and dreams of children are not hampered by their economic status. Inspirit believes when you change a child’s life, you change a family’s, which can change a community and ultimately change the world. Our Evening Tutorial Program is customized to suit each child’s profile to understand his/her aspirations, interests and problem areas which require special attention. 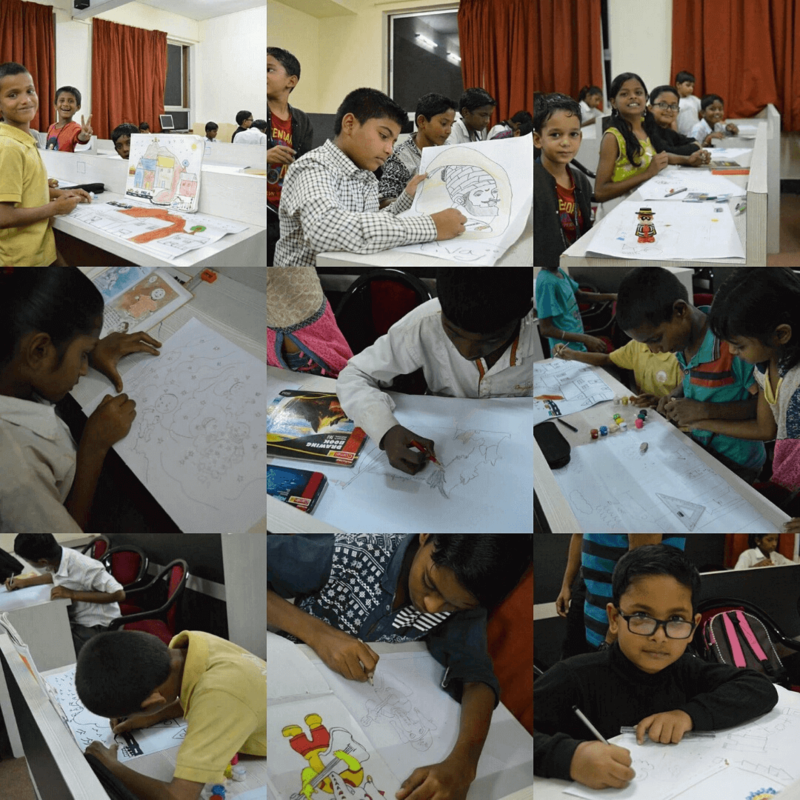 We constantly monitor their academic progress and promote engagement in activities like sports, painting workshop, personality development and educational movies which help them explore their creative side and channel the same creativity in the right direction. On an average the student volunteers spend about 500 contact hours per annum with the children. The volunteers comprises of the senior and the junior students of the full time graduate MBA program of SCMHRD. The teaching plan and strategy is customized to suit each student (beneficiary) profile. The entire volunteer team gets together and talks to the child in order to understand his/her aspirations, subject preferences, difficulties and problem areas. This helps the team to gauge the starting point for beginning the training intervention. Another challenge that the team often encounters is the poor level/understanding of spoken and written English among kids more so since they come from vernacular backgrounds. In such cases the basics of English language such as phonics are used. A teaching plan is prepared for each child after the in-depth interview with the child and after based upon the feedback of the team members. A register and excel worksheets are maintained by the team in order to manage the process effectively. Detailed logs about the attendance, topics/chapters covered, evaluations, marks, syllabus covered per student are maintained. Maintaining detailed records per child prevents repetition of topics and subjects. More importantly detailed observations and notes about the progress of each child along with special precautions (if any) help the volunteer team members to function effectively and improve the learning experience for the child. Every day the volunteers spend 2 hours (18:30 Hrs to 20:30 Hrs) with the children. Despite a very rigorous schedule the volunteers plan and adjust the teaching time-table slots such that all the team members are able to conduct this activity without missing out on their own classes, assignments and evaluations. Saturdays are assigned for ‘learning-through-fun’ activities like showing educational videos, having sessions in drawing, art and music. 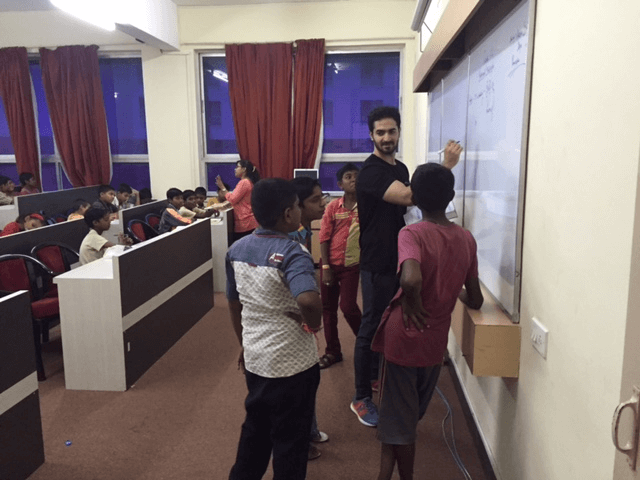 The volunteer team strives to make learning an enjoyable experience for these kids more so since they come from challenging backgrounds while ensuring that they are able to make the child learn at his/her pace in an interactive manner. 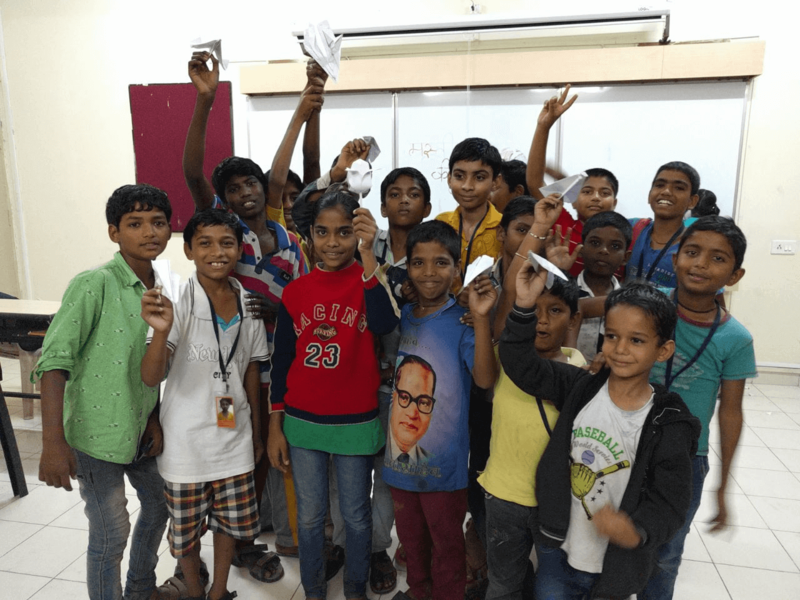 The two hours that these kids spend on the campus of SCMHRD is the only time that they usually get to ‘live their age’ before they get back into an environment where more often than not- they become an extra pair of hands engaged in some income augmentation activity. 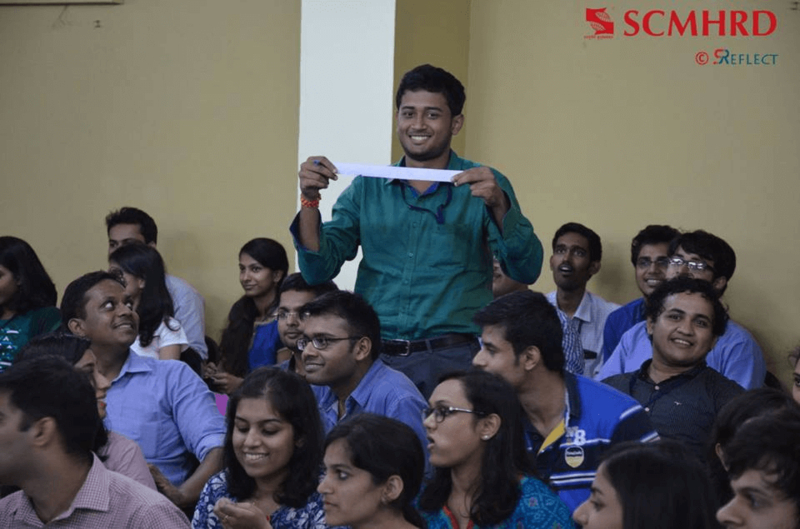 Tambola Night 2016, an annually organised event of fun and games by Inspirit (Prayatna), was organised for the students of SCMHRD on 1st of August, 2016. 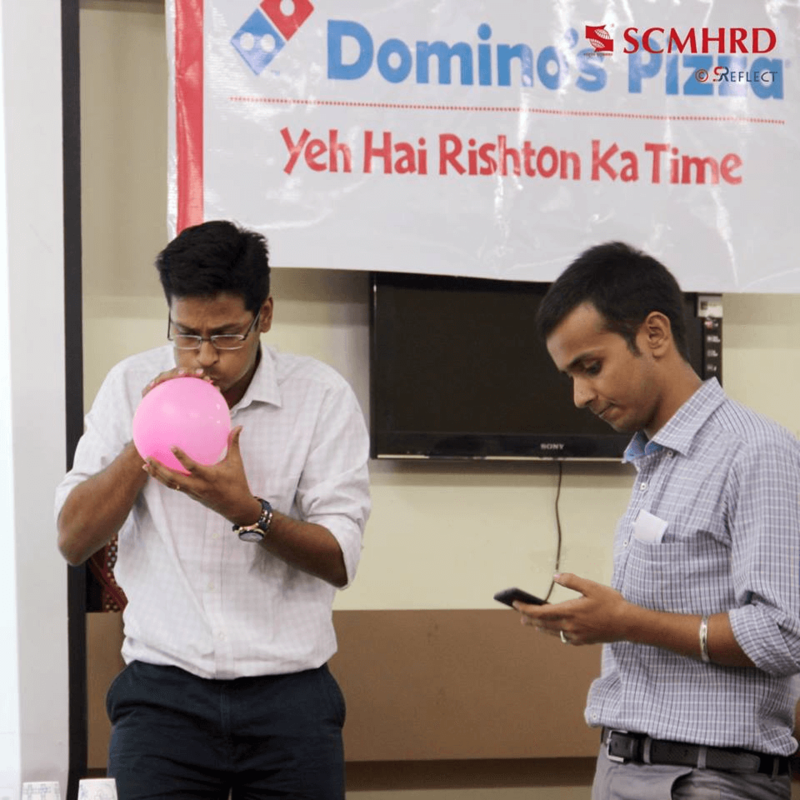 The event saw a huge turnout of 120+ students with Dominos being our title sponsor. 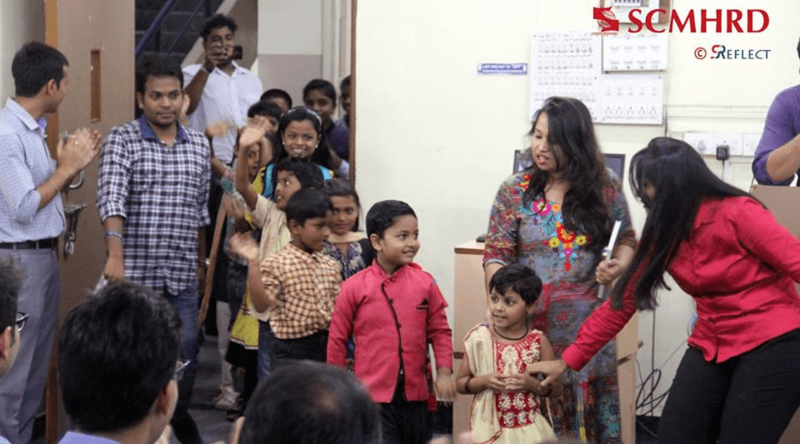 The 2 hour event was organised for the children adopted by Inspirit that saw an overwhelming participation by the students of SCMHRD, who contributed towards our cause and helped us sell more than 400 tickets. 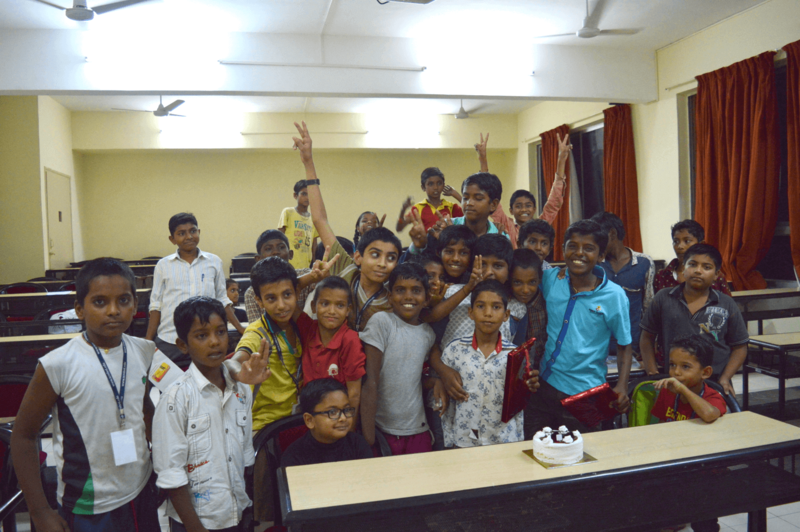 The fund raised was contributed towards bettering the future of these children. The event kick-started with Team Inspirit introducing the 42 little champions of Inspirit. The kids sang for and with the crowd and had a gala time. We decided to add more fun and excitement by having a series of fun games and quizzes for all the participants. 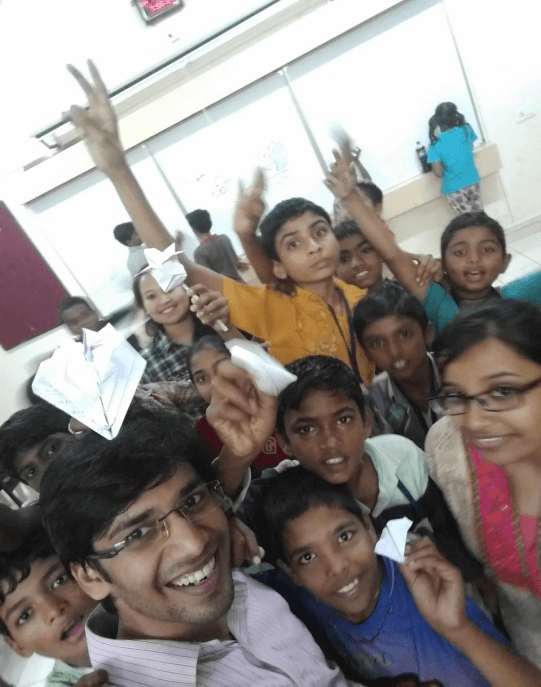 Fun filled activities where the winners got exciting prizes and goodies. 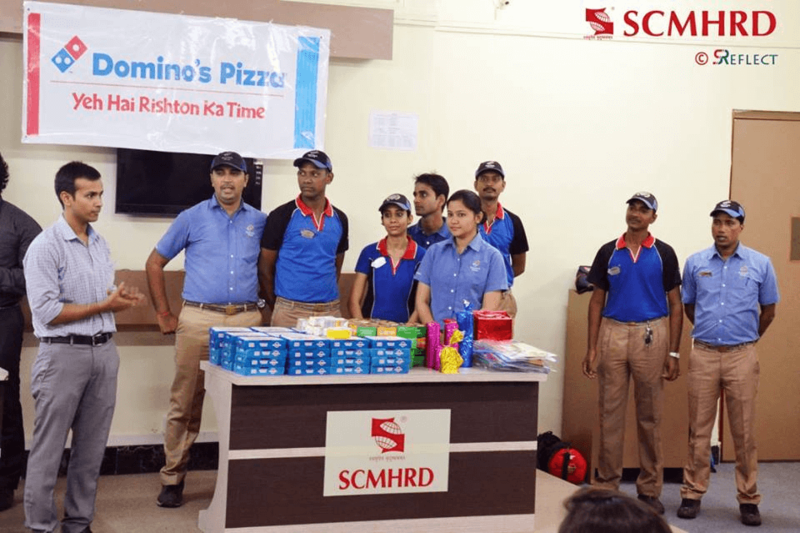 The title sponsors, Dominos and our team brought a smile on many a faces by giving them delicious refreshments. 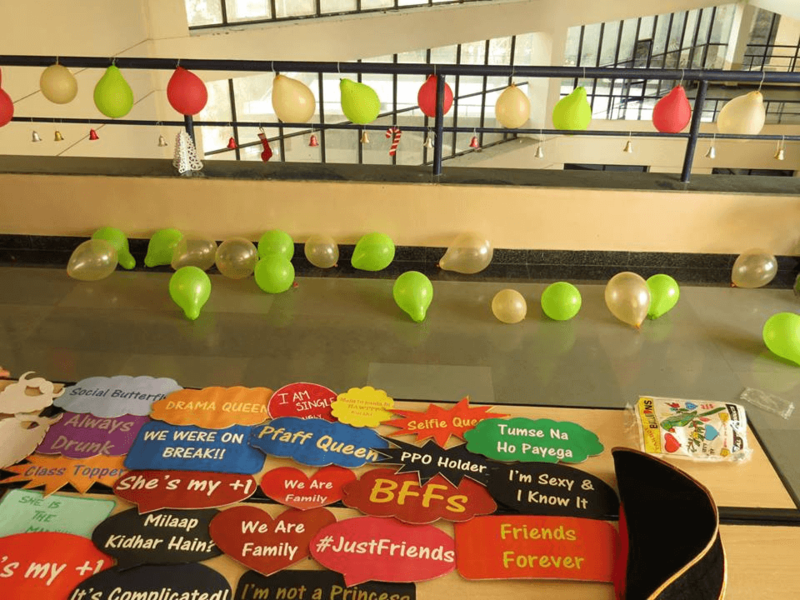 The snacks included Pizzas, Zingy Parcel, Frooti, Biscuits and lots more. An extremely proud moment for us, two of Inspirit’s very own stood 1st and 2nd in their class. We make sure to celebrate all kinds of academic and extracurricular success achieved by our kids in order to encourage others to do the same in the future. 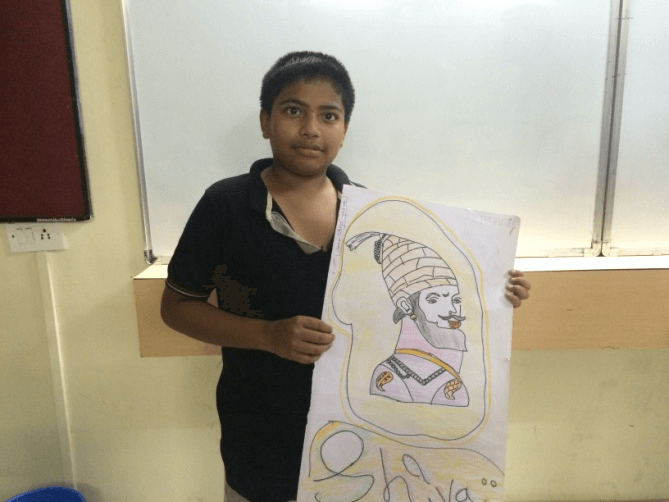 Knowing the importance of art and craft, we try to keep our kids engaged with activities that enhance their creative side along with the academics. 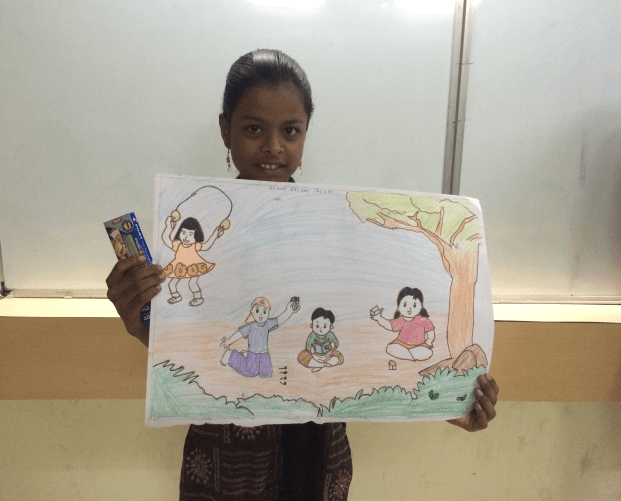 We conducted a drawing competition for the kids where we provided them with chart papers and colours and let their imagination run wild. We want our kids to learn something new with every class they attend at Inspirit. 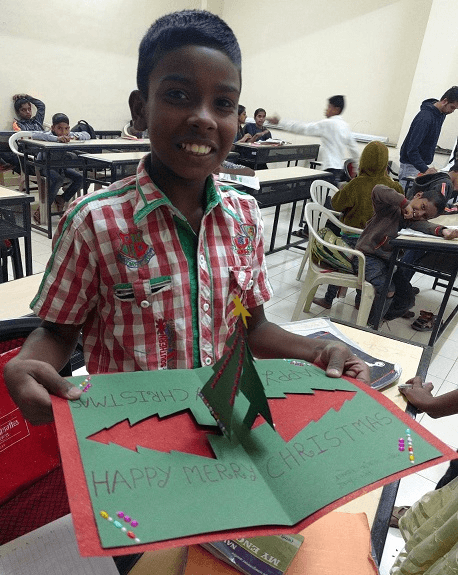 The concept of Origami was taught to the kids on a weekend class, making it a highly productive day where the kids as well as the entire team got to learn new and creative way to make decorative items with the help of paper. The weekly volunteer programs give a chance to all the students of SCMHRD to contribute to the noble cause in their own special way. From becoming the kids’ new favourites to coming back time and again to teach the kids, our volunteers have contributed immensely to the lives of our children and have become an integral part of our committee. Online Trackers have been made that keeps track of the syllabus being covered in school as well the attendance of the Students, Committee members and the volunteers. This helps us track the progress our kids are making in terms of completing their exam syllabus on time and also helps us work on the areas where our kids are lagging behind. 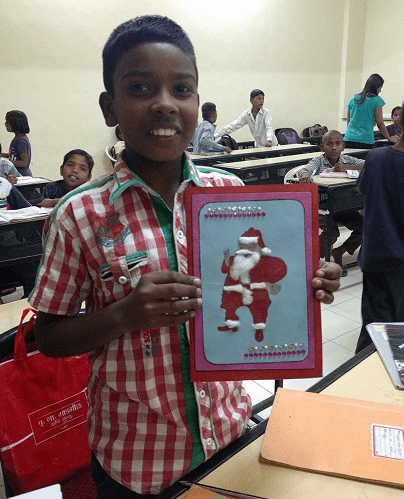 A Christmas Card decoration competition was held for the kids of Inspirit where the winner got chocolates and candies as a prize. 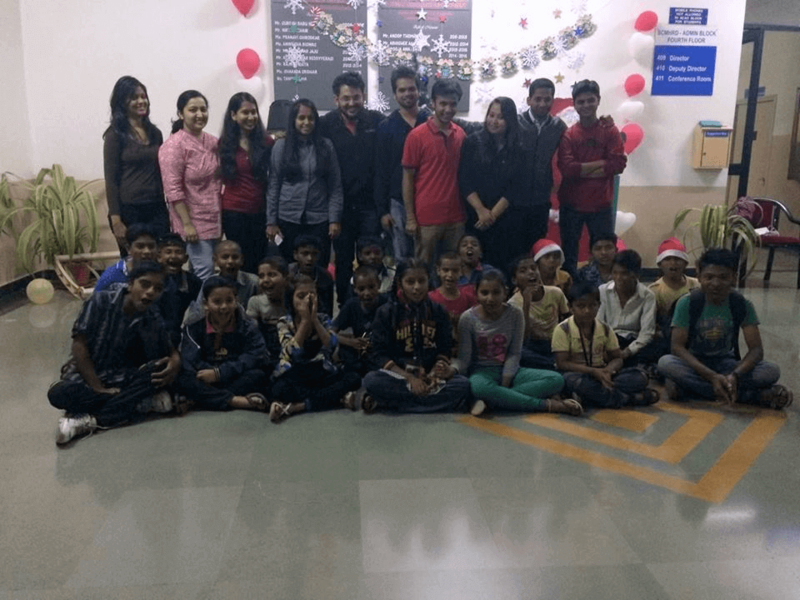 2016 came to an end with Inspirit’s grand Christmas celebration that saw a huge turnout by the students of SCMHRD. 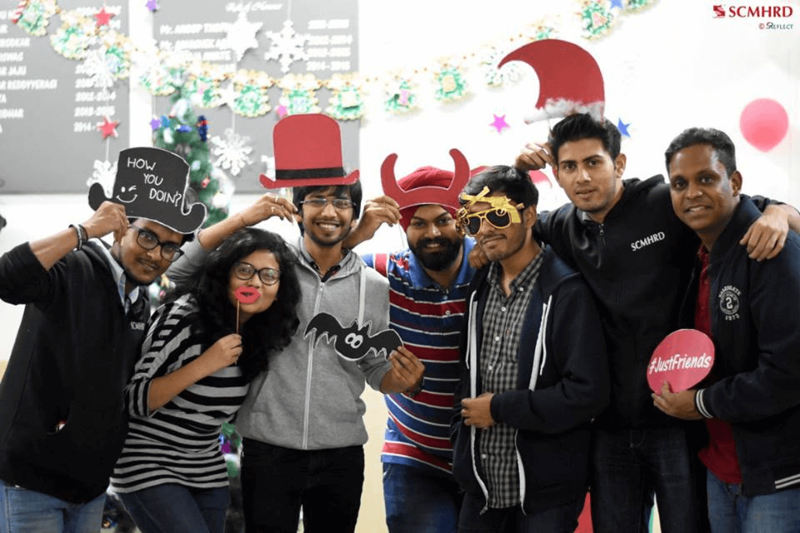 Inspirit’s tradition of Photo Booth continued with an added joy of the Christmas and a visit by our very own kids. 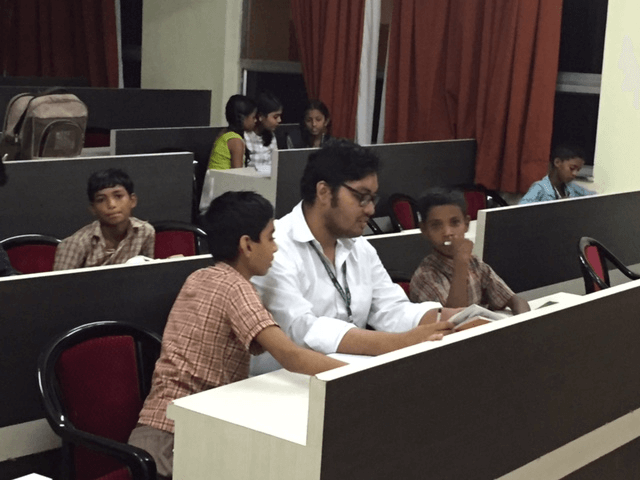 TE.A.CH, an initiative by INSPIRIT, is a two-day drive that will focus on imparting much needed value and education, and bringing the power of awareness among the school children in the vicinity of SCMHRD. 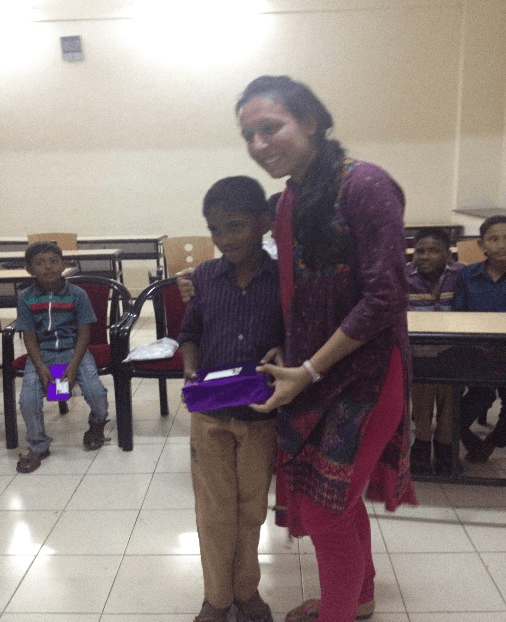 Students of SCMHRD have a lot to offer and have always shown willingness to do something for our children by volunteering for our tutorial program as well as actively participating in all the events conducted by INSPIRIT. 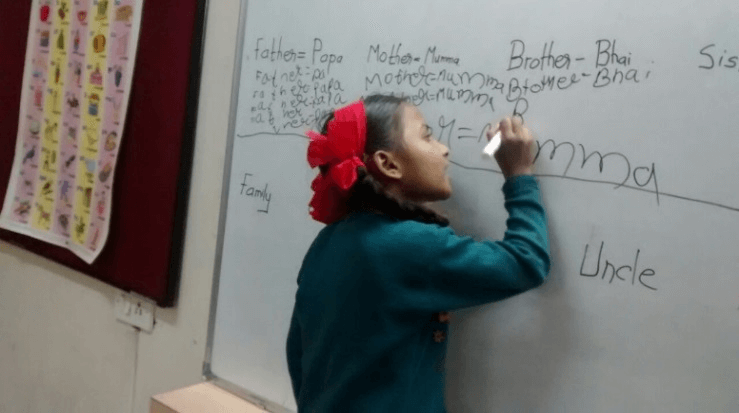 We recognize the importance of all the domains mentioned above and feel that a special session is required for imparting knowledge on the same as these are not the part of their daily school curriculum.